Weighs just two ounces, this durable, self-contained unit delivers an accurate pulserate and blood oximetry in just seconds. Auto on/off. 1 year warranty. Weight: 2 ounces (60 g) with batteries. 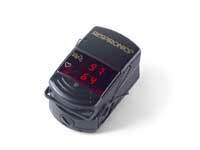 The Pulse Oximeter provides fast, reliable SpO2 and pulse-rate measurements on any patient from infant to adult. It's designed for simple, accurate spot-checking and is a member of a full-line of pulse oximetry products offered by Invacare.